Stations The typical station consists of two levels - concourse and platform. The concourse provides ticketing facilities and other passenger amenities as well as access to the system. The platform is for waiting, boarding and alighting from the train. Please be aware that the train may approach the platform anytime, from any direction. Trains The trains are designed to high international standards. Doors open / close automatically. Beeper sounds will warn you when the doors are about to close. If standing please stand clear of the door's at all times. Track Stay away from the track and electrified rails. Pay attention to all warning signs. Trespassing onto the track area can cause severe injury to yourself or others. 3. 5 year lifetime from date of first use. 1. Purchase a ticket from the Ticket Issuing Machine or ticket office. 2. To enter the the skytrain system, insert the ticket into the entry gate and be sure to hold on to it - you will need it to exit. 3. To exit, insert the ticket into the exit gate. The Single - Journey Ticket will be taken; the Stored-Value Ticket will be returned to commuters for future rides. Checking the remaining valueThe current value of any stored value or concession ticket can be checked at any BTS ticket office. Also when exiting the gateway the remaining value will show on a display located on top of the gate. 1. SJT Tickets : If a passenger purchases a ticket and is within the system less than 5 minutes or does not enter the system and decides not to travel an immediate cash refund can be obtained by applying at the BTS Station Ticket Office at the station where the ticket was purchased. An immediate cash refund can also be obtained in case of train delay. 2. Concession Tickets : These tickets are non refundable. 3. Sky Card : If no value or negative value remains on a Sky Card ticket a cash refund of net ticket value (30 baht - negative value) can be obtained immediately at any Station Ticket Office. If there is value remaining on the ticket and the passenger wants a refund then the passenger must request a refund envelope at any BTS Station Ticket Office. It is then necessary to fill in the required information, insert the ticket to be refunded into the envelope and return it back to the Station Ticket Office. The refund envelope's stub will be returned to the passenger for reference. A refund in the form of a check will be available in two weeks time. Passengers requesting a refund will be notified by telephone when their refund check is ready. Refund checks can be picked up at the station where the refund envelope was submitted. Replacing tickets Concession Tickets - in case of a damaged or malfunctioning ticket the passenger should take the ticket to any BTS Station Ticket Office where the ticket will be analyzed. If it is possible the station staff will replace the ticket immediately. If not, the ticket will be sent to the Head Office. In this case a new ticket will be sent to the station where the complaint was registered within 3 working days. Sky Cards - Replacement of Sky Cards will follow the same procedure except if the ticket must be returned to the Head Office in which case a new ticket will be made available within one weeks time. Expiring Sky Card - Sky Cards have a 2 year validity period. 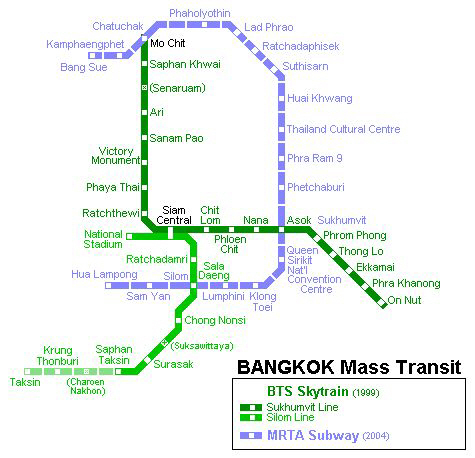 The expiry date of a Sky Card can be checked at any BTS Station Ticket Office. If the ticket is close to the expiry date the passenger can ask for an immediate replacement. The deposit and any remaining value will be transferred to the new ticket at no cost.